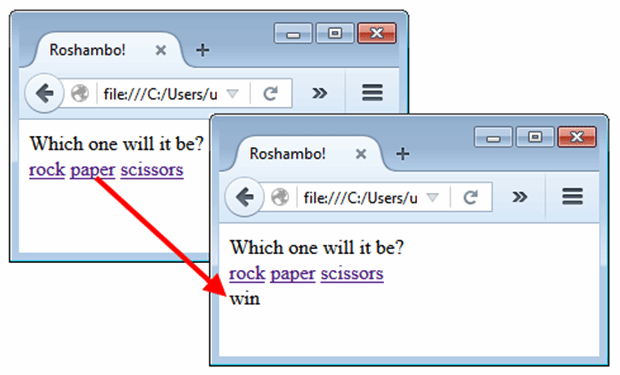 The webpage presented to the user for this example (Figure 1) will simply ask the user, "Which one will it be?" and will present three links for the user to click on: rock, paper or scissors. Figure 1. 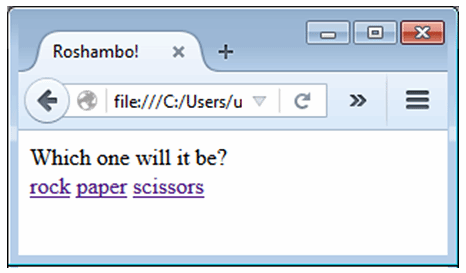 The roshambo user interface with a prompt and three links. This code can be entered directly into any standard text editor, saved to the desktop or home directory of your computer, and saved in a file named roshambo.html. After the file is saved, double-clicking on the file will open it up in a browser and the text and the links would appear. Unfortunately, at this point, clicking on the links won't do anything. To get the links to work, we need to add some scripting. The three links on the page are created using anchor tags, which use the element a and have two key attributes: href and onclick. The href attribute is typically assigned to the URL of a page that will be loaded when the user clicks on the link. Because we want the user to stay on the current page, and not navigate away to somewhere else on the Web, we set the href attribute to the hash sign: #. This makes the page self-referencing. Instead of navigating to another page when the user clicks on rock, paper or scissors, we want an alert box to appear telling the user the result of playing the game. To make this happen, we hijack the onclick method associated with the link, causing that event to trigger a method named playRoshambo. 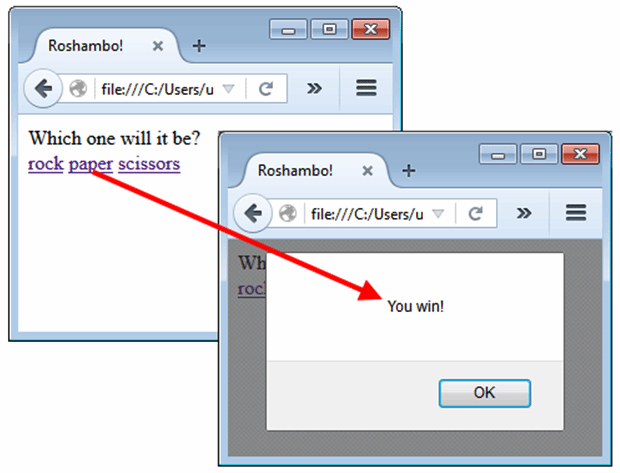 If the user clicks rock, the text String rock is passed into the playRoshambo method; if paper is clicked, the text String paper is passed in, and the same thing goes for the scissors link. Of course, if we are passing text into a method named playRoshambo, we need to code a method named playRoshambo. Notice the final statement in the method: alert("You " + outcome + "!"). This line of code will trigger a dialog box to appear that displays the game's result (Figure 2). And now, when the application runs, the results are displayed on the page (Figure 3), not through an alert box. Figure 3. The roshambo application that updates the document model of the webpage.